A few months ago we introduced the Leader 3, a 3″ FPV drone. Now, it’s time to have a closer look on FullSpeed’s latest mid-sized quad, the Leader 2.5SE. 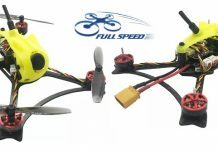 As you may guess by the naming and its smaller 120mm sized frame, the FullSpeed Leader 2.5 drone is designed for 2.5″ propellers. The difference between the Leader 2.5 and Leader 2.5SE is only the protective canopy. Disappointingly, they’ve chosen an older generation F3 flight controller, instead of a much versatile F4 flight controller. As FPV rig, the FullSpeed Leader 2.5SE comes with Caddx Micro F2 FPV camera and FullSpeed TX600 video transmitter. Multiple canopy color options (black, red, yellow, blue, purple and transparent). Being sold as PNP package, you will need few things in order to be ready for take-off. Besides flight battery and charger, you will additionally need a compatible radio receiver and transmitter. 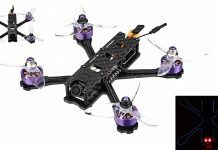 FullSpeed suggests to use a 2S 550/650mAh or 3s 450/550mAh Lipo battery with their Leader 2.5 drone.